The control of unmanned underwater vehicles (UUVs) is challenging due to the non-linear and time-varying nature of the hydrodynamic forces from the surrounding fluid. In addition, the presence of external disturbances makes the control even more difficult. Model reference adaptive control (MRAC) is an adaptive control technique that performs well in such situations, while the improved composite/combined model reference adaptive control (CMRAC) is capable of better transient performance. However, the latter is yet to be used in UUV controls. 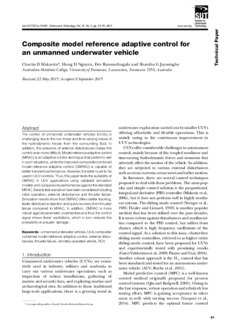 Thus, this paper tests the suitability of CMRAC in UUV applications using validated simulation models and compares its performance against the standard MRAC. Several test scenarios have been considered including initial operation, external disturbance and thruster failure. Simulation results show that CMRAC offers better tracking, faster disturbance rejection and quick recovery from thruster failure compared to MRAC. In addition, CMRAC is more robust against parameter uncertainties and thus the control signal shows fewer oscillations, which in turn reduces the probability of actuator damage.